Cycling is a popular activity in Alpharetta, and it’s easy to understand why. Our city is bathed in sunlight for an average of 218 days a year. There are many locations to ride, whether you prefer to explore the Big Creek Greenway, ride around the city, or have your eyes on the development of the multi-use Alpharetta Loop trail network. Unfortunately, individuals who ride bicycles are very exposed on the road. They run the risk of being involved in dangerous accidents and suffering serious personal injuries. At Williams & Williams Law Firm, we know that drivers and pedestrians can behave negligently and fail to respect your rights as a cyclist. If you live in Alpharetta, Atlanta, or a neighboring community in Georgia, please call 770-823-2711 to discuss your bicycle accident case for free. Our experienced lawyers can explain your legal options and help you pursue justice and compensation for your injuries. According to statistics prepared by Bike Alpharetta, 94 percent of cyclists involved in collisions during 2016 and 2017 suffered injuries. The majority of these accidents occurred on the road, with a large number of them taking place as cyclists entered crosswalks. Every state has unique bicycle laws that are intended to prevent accidents from occurring and to keep cyclists safe. It is crucial to follow these rules to protect your right to compensation in the event of an accident. A bicycle is a vehicle and cyclists must follow all traffic laws. 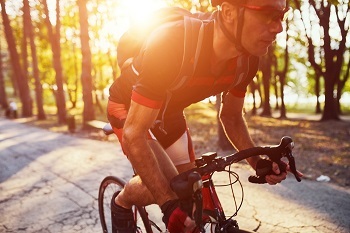 Cyclists should ride as near to the right side of the road as possible barring reasonable exceptions such as making a left turn or avoiding unsafe road conditions. A cyclist traveling the same speed as traffic is exempt from this rule. All cyclists under the age of 16 are required to wear a helmet. You cannot carry any additional riders unless the bike is designed and equipped to do so. You cannot ride more than two abreast unless you are on a path designed for bicycle use. You are required to use specific reflective equipment at night. Cyclists and drivers are required to follow traffic laws and exercise reasonable care in their actions. In many cases, accidents between bicycles and cars are caused by a negligent driver. Bicycle accidents do not always occur because of a driver’s negligence. You can sustain injuries on a bicycle due to hazardous road conditions. Road hazards that can cause bike accidents include potholes, sewer grates, gravel, and uneven pavement. In these cases, the agency responsible for maintaining the roadway may be responsible for your injuries. Bicycle accident injuries are often severe and can take a toll on your financial and emotional well-being. You may be facing a mountain of bills and suffering from a limited ability to work. Our attorneys will seek maximum compensation for all of the ways that this injury has negatively impacted your life. In Georgia, you can still seek compensation even if you were partially at fault for the accident. However, your monetary recovery will be reduced by your percentage of fault. If you have been injured in a bicycle accident, please call 770-823-2711 to schedule your free case evaluation. We operate on a contingency fee basis, meaning you do not owe us anything unless we are able to successfully recover compensation for you. At Williams & Williams Law Firm, we are proud to serve clients in Alpharetta, Atlanta, and nearby areas of Georgia.